Beautifully packaged with a ceramic dipping bowl, Ogilvie & Co's Black Truffle Aioli is a delicious, creamy condiment that will bring a taste of luxury to your table. 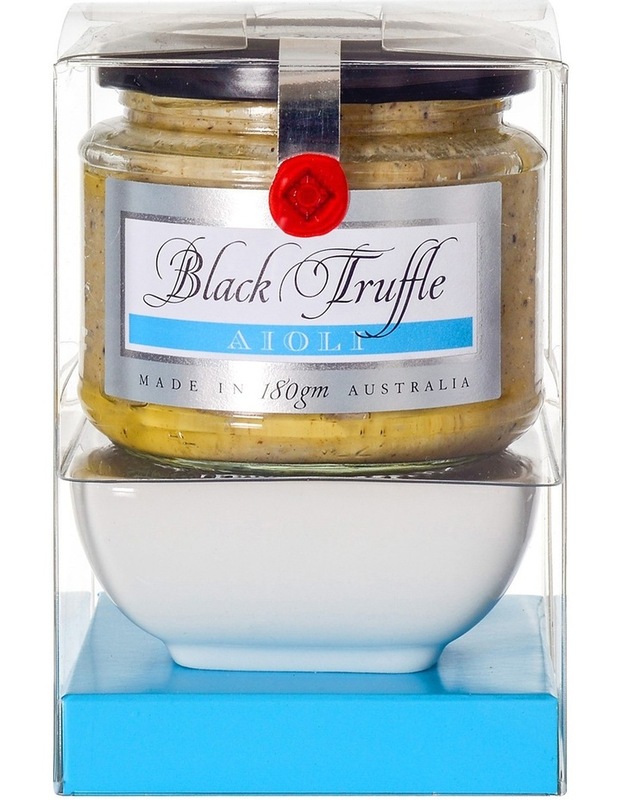 Made with premium Black Perigord Truffles sourced from the Manjimup region of Western Australia, this superb aioli is addictively delicious. Try serving with chicken or seafood, or use in wraps, sandwiches and salads for an easy and delicious way to experience the unforgettable taste of truffle. Ogilvie and Co are an Australian family-owned manufacturer of gourmet food products founded in 1987 in Perth, WA. Since its humble beginnings operating out of a vacant corner butcher shop Ogilvie & Co has grown to become one of Australia's leading manufacturers in the gourmet food industry. Hand made using traditional preserving methods, Ogilvie & Co has a constantly evolving range of product known for its high level of quality, presentation and signature red seal. Soybean oil, egg yolk, water, whole egg, vinegar, sugar, salt, lemon juice, black perigord truffle (2%), olive oil, natural mustard flavour, garlic, salt, preservative (385), truffle aroma, spices. Contains egg & soy. Manufactured on premises that handles Peanuts, Tree nuts and sesame seeds.